"They followed it with the much earlier and much better known “Auf dem Wasser zu singen (To Sing on the Water).” Here, voice and guitar were the aural equivalent of shimmering sunlight on tiny waves. Schubert set Eduard von Bauernfeld’s German translation of William Shakespeare’s “To Silvia” as well as A. W. von Schlegel’s translation of the Bard’s “Serenade.” Sly and Britton separated these two songs of wonder and praise with the melancholy “Du Liebst mich nicht (You don’t love me).” They performed all three with vocal and instrumental colorings that brought out the deeper meanings of the words. Writing in the early 1860s, Schubert biographer Heinrich Kreissle von Hellborn says the composer wrote his “Ständchen (Serenade)” in 1826 while he and a group of friends were dining at a restaurant in a suburb of Vienna. Sly and Britton gave an exquisite performance of this charming song. I imagine every woman listening wished her lover could sing its phrases half as gracefully." "Britton’s transcriptions of the sixteen songs on this disc preserve the defining qualities of Schubert’s writing for piano whilst introducing unique nuances of their own. Impressive as Britton’s arrangements are, his playing of them is still more enjoyable. 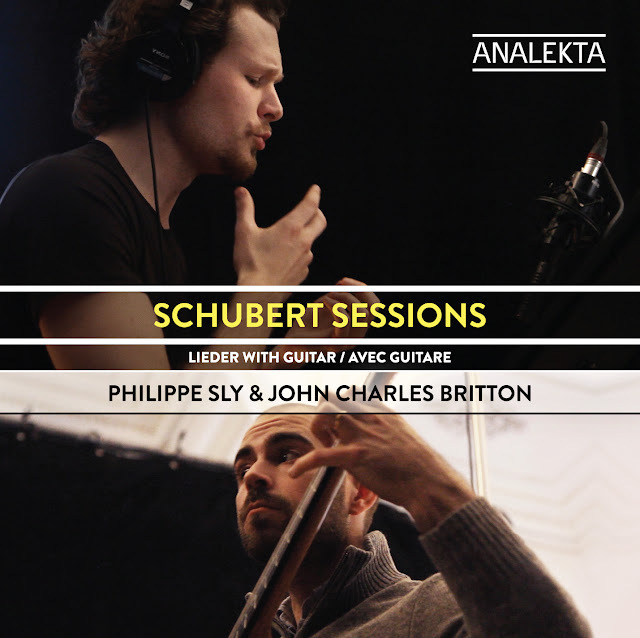 It is not merely that the guitarist’s nimble-fingered performance conquers every challenge of Schubert’s music and his adaptations of it: his playing is equally nimble-hearted, the emotions of each Lied heightened by his intuitive phrasing. The range of dynamics that Britton coaxes from his guitar is astounding. The guitar is his voice, and through its strings he sings with the strength and suavity of as noted an interpreter of Schubert as Hermann Schey." 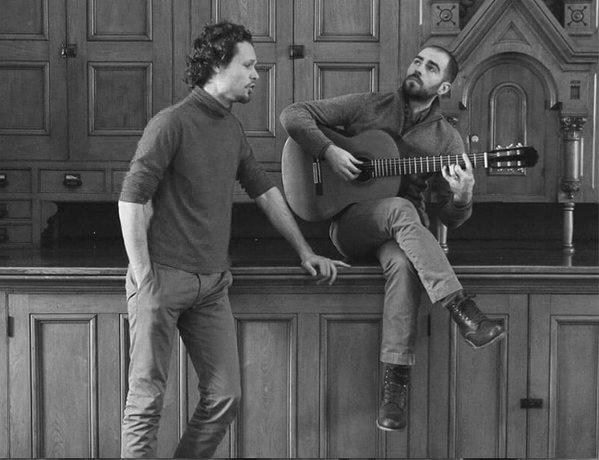 With bass-baritone and frequent collaborator Philippe Sly; image by Mathieu Sly. 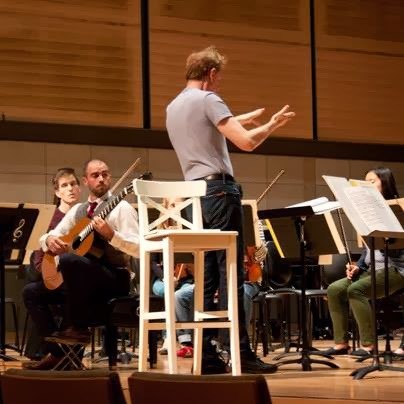 "The chamber scale of the orchestra allows for a variety of solo voices, giving the impression that the guitarist is the principal guest at a very large dinner party. He (in this case) is the center of attention; but everyone else seems to have something to say, not always necessarily to him. In this case Neale's job was to express the full scope of that interplay without ever distracting from the role of the guitarist as principal soloist, and the result was a delightful reminder that we should all have more opportunities to listen to Françaix's engaging inventions." "The critical issue was one of dynamics, and yesterday evening Britton's dynamics made a perfect match for the salon space at the Rex. Sly took him cue from the subdued qualities of Britton's instrument. This made for a pleasant contrast to the efforts of those piano accompanists whose approaches to Schubert are given to anachronistic extremes."